Snippets of Jack: "...and a captain who is clearly mad?" "...and a captain who is clearly mad?" The crew of the 'Black Pearl' have faced some very interesting situations with their Captain. Including becoming almost completely frozen, battling fish people, battling half dead people, and sailing around the world in search of a heading. Don't you feel for them even a little bit? But hey they always finish the rum, so they deserve it right?
" We are not among the living and so we cannot die." 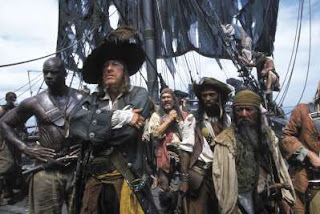 --Barbossa and his crew while he was captain of the black pearl. 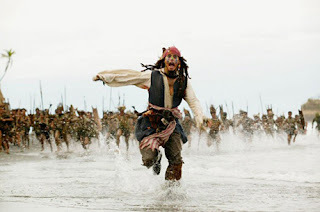 Jack Sparrow to his new crew - Do you have the courage and fortitude to follow orders and stay true in the face of danger and almost certain death? "What about Jack!? I won't leave without him!"